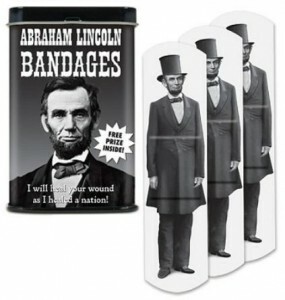 Now you can have a Abraham Lincoln shower curtain and that makes you feel all presidential when taking a shower. 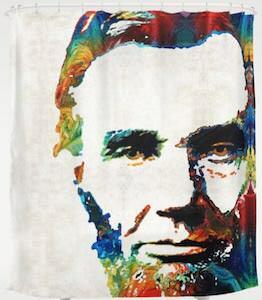 The Abraham Lincoln shower curtain has a light colored background and on it you can find the face of President Lincoln himself made out of a wide range of colors which really looks amazing. The Abraham Lincoln shower curtain is 71 x 74 inches and has 12 eyelets for your shower hooks and if Abraham ever gets dirty then you are in luck as you can put this shower curtain in the washing machine. 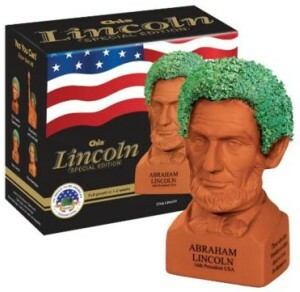 Now you can have a president in your bathroom staring at your while you are brushing your teeth. 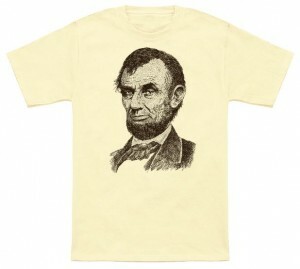 On this t-shirt you can find one of the Presidents of the United States Of America and yes it is Abraham Lincoln. The portrait of Lincoln is placed in a square that has a red and blue background making the black and white portrait of the President stand out nicely. 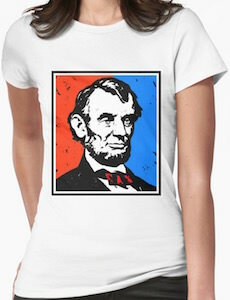 You can get this Abraham Lincoln t-shirt in many styles for both men and women and it comes in many cool colors to so that you can really create the look you want while having the former president near. 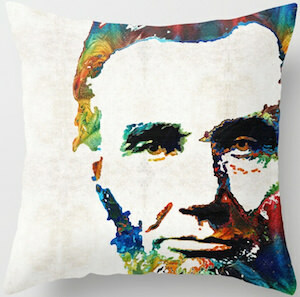 And yes Abraham Lincoln would have been our and that is why the image has a worn look to make it more like it should. Abraham Lincoln was the 16th President of the United States and many think he was one of the best. Show off your support with a cool fashionable tie that is great to dress up and wear for any occasion. On this tie you will see a classic black and white image of Lincoln’s head and upper torso, find a print of multiple images in a series covering the entire necktie. This Abraham Lincoln tie is a standard size tie that measures 55 inches in length and at it’s widest point it measures 4 inches. It is made from 100% polyester and has a sleek and shiny smooth finish using vibrant colors to really stand out and look good. Abraham Lincoln was the 16th United States president and of course he is famous for his tall hat. 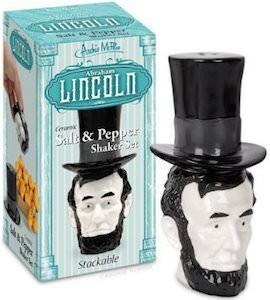 If you like Lincoln and spiced up things then this salt and pepper shaker is what you need. As you can see on the picture this just looks like a ceramic Abraham Lincoln but it’s not. Yes it is ceramic but the head of Abraham is the salt shaker and his tall hat is the pepper shaker and they stack neatly to make the perfect president. Just imagine have Abraham Lincoln at your dining table just to keep you food at the right spice level.